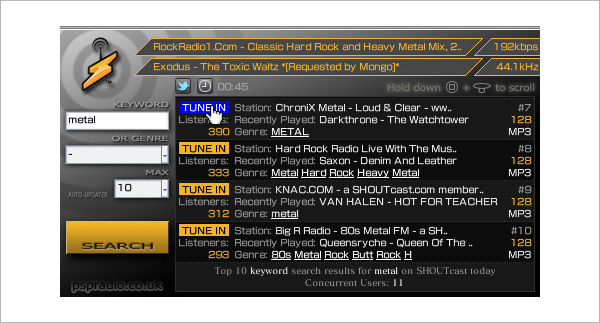 It’s been a long time since I have updated SHOUTcast version of the PSP Radio, so here it comes. The new version includes a pretty neat sleep timer. Operated by a single click, sleep timer offers a range of preset intervals – 00:15, 00:30, 00:45, 01:00, 01:30 and 02:00 hours. Selecting 00:00 will cancel the timer. Another added feature is a status bar at the top of the screen. It now shows stream buffering progress when selecting a new stream. Also switching between streams and stream handling have been redesigned to make it more simple and reliable. Outstanding! This is a mighty good radio player. Thank youuuuuu, KK! 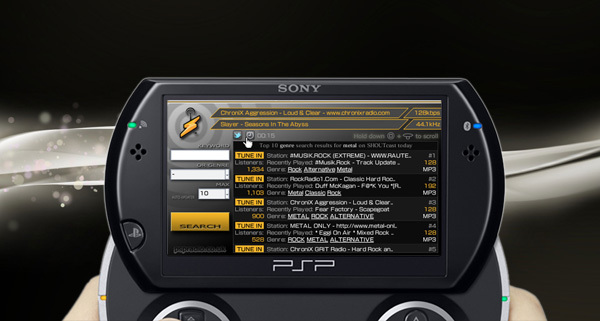 Love your ps3 and psp players. Is there anyway to enter a url for a private shoutcast server on the local network? Just tested, all works for me. Try different memory card or make some space on your current one. You cant, shoutcast stream ids change all the time so there is no point. The player is broken , on ps3 the radio feeds do not load, flash has changed i think. thats right, ps3 player stopped working all together so i changed it so it would work on pc at least. it was working fine before the player gui changed, have you any idea why it changed? love you work btw. I changed it and added different player, because 3rd party service previous player was using stopped working.